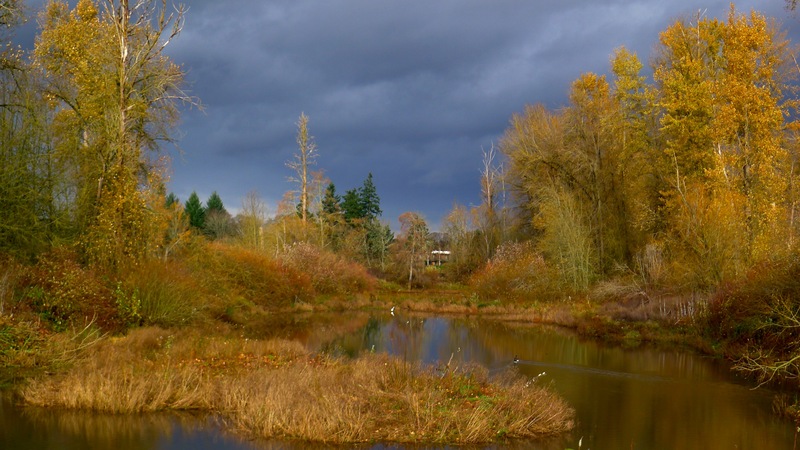 Yesterday was a day of dark storm clouds broken by sudden sun openings. Although I felt weak from a lingering flu, I picked up my camera for a short walk to see for myself what all the drama was about. 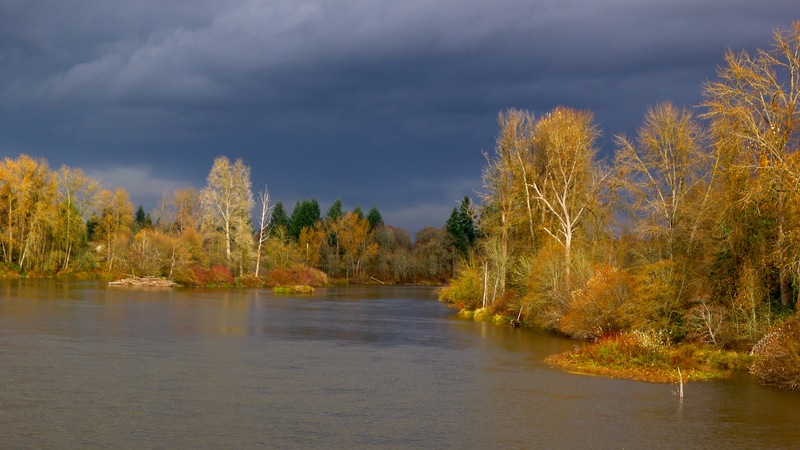 From the bridge over the Willamette River, still golden cottonwoods lit up with sunlight while thick, black clouds roiled behind. The light quickly changed to shadow and then the sun came back again, so my vision seemed to move between the everyday world and that Otherworld always waiting for a turn of the head, the shift in light that would reveal that world where every object is imbued with its own spirit and is waiting to speak to you about whatever is in your heart. As I was crossing the boardwalk between two ponds, I stopped to frame an image of leaves, water, and reflections when I was startled by the banking flap of enormous wings. 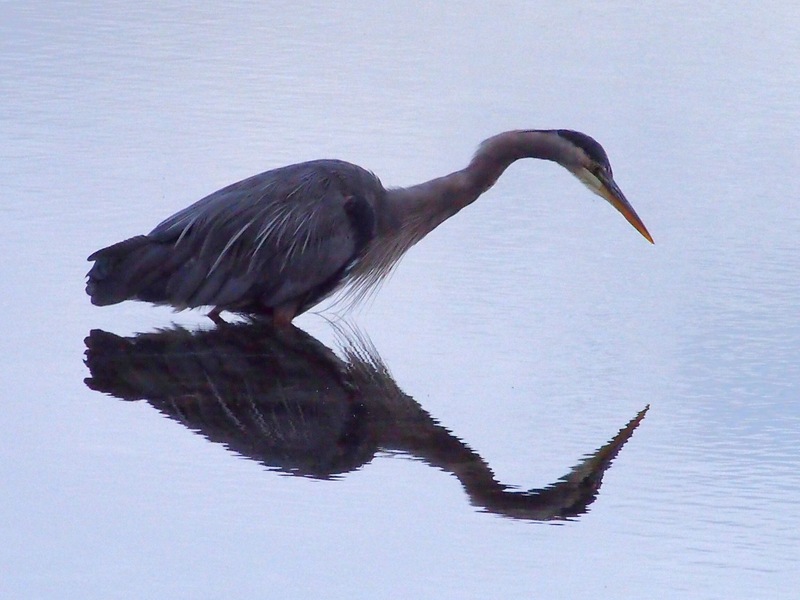 Great Blue Heron had flown directly into the focus place of the photo I had framed. Back in the 1980s during the Human Potential Movement, my friends and I liked to play with Animal Cards. 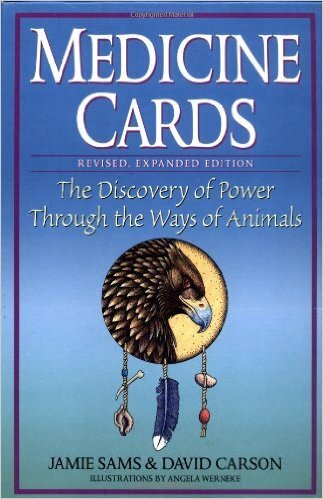 Each card had a different animal on it, and its qualities translated into human terms in a little accompanying book. When we had a chance encounter with an animal in either the real world or through dream or another chance encounter such as the logo on a truck that arrested our attention, we would say that the animal “flew into my cards today.” We would look up the meaning of the card and through drawing and journaling think about the lesson or insight the animal was bringing. I consider this to be High Play. 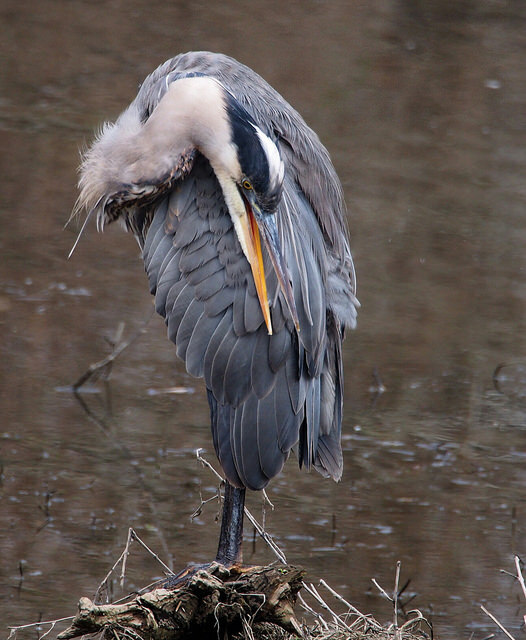 Well, Great Blue Heron had certainly flown into my cards–smack into the intense focus of my camera. I didn’t actually know anything about the symbolic or shamanic meaning of cranes or herons in Western traditions, so I did due diligence when I got home and looked it up. 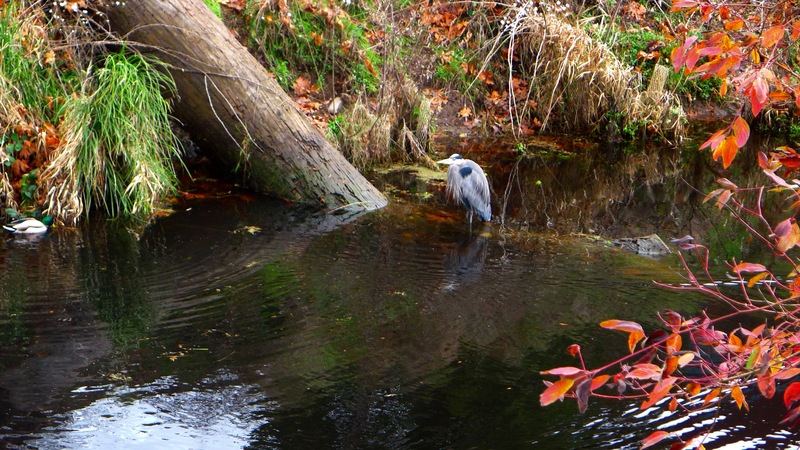 I learned that herons and cranes were important in Celtic mythology. One reason was because those bird species lived in a misty environment between land and water–the marsh. Just as an hour of quick-changing sun and shadow shifted my seeing between worlds, so does the heron live in that liminal place at the doorway to the Otherworld. I really love the other reason, too, which I learned from Anna Franklin’s excellent online site, Power Animals, Allies and Totem Animals, “The Celtic god Ogma was said to invented ogham [an ancient British and Irish alphabet] after watching the flight of cranes, the shapes of the birds against the sky giving him the idea for the angular letters.” As a poet and writing instructor, the idea of my writing springing from the shapes of birds against the sky is deeply satisfying. I have been thinking pretty much non-stop lately about the Mysterious Night Vision Field Journal and the classes my sister and I are creating. The appearance of the Great Blue Heron literally flying into my focus tells me we are on the right track. Your Mysterious Night Vision Field Journal is your Secret Book, your Book of Dreams where you draw and journal in that numinous space between land and water where the heron lives and feeds. 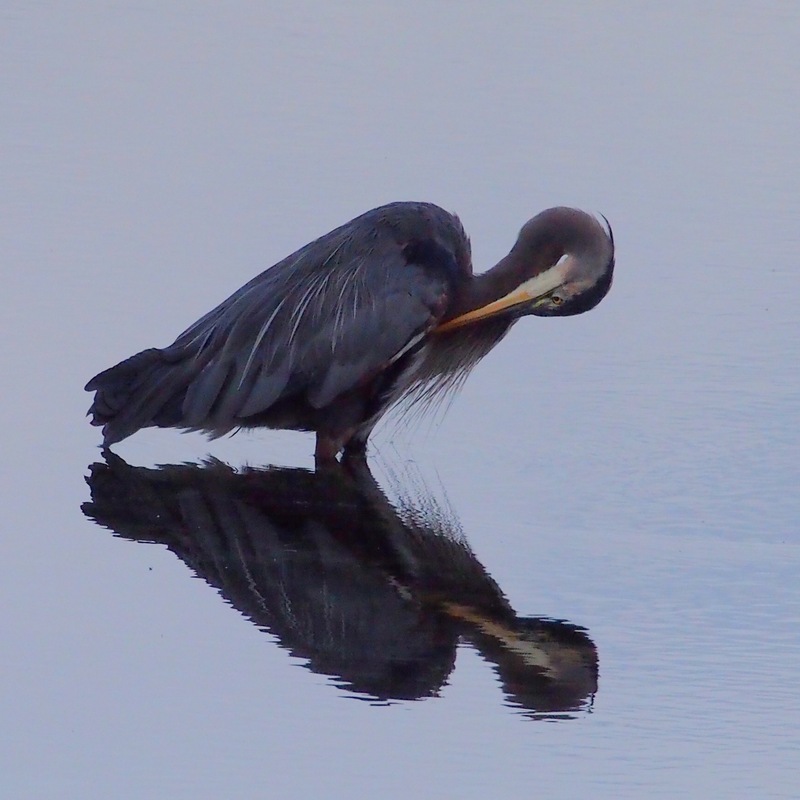 We look at the outer world with our inner eyes, and when the heron flies, we understand the writing their stick legs and archeopteryx shapes make against the sky. When the heron flapped giant silver wings into my lens, folded up and settled on his log in the pond, I got goosebumps all over. I definitely felt the necessity of responding to this vivid visitation in my Mysterious Night Vision Field Journal; this time as this blog post. 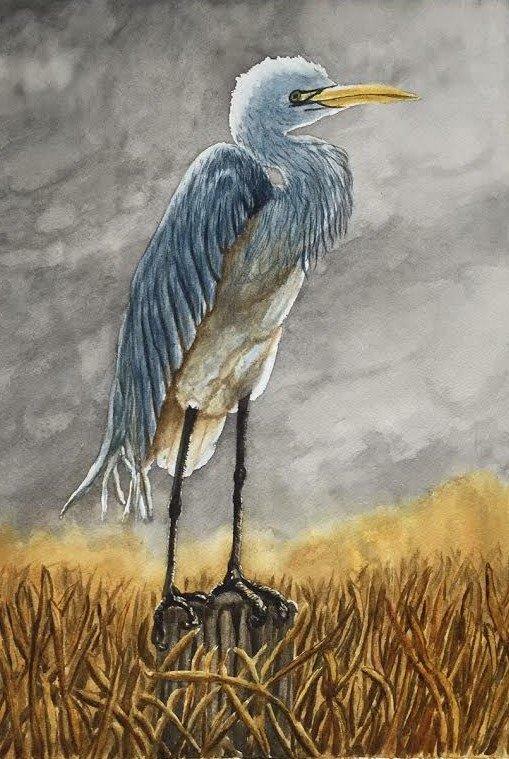 This beautiful watercolor sketch is by one of Cheryl Renee Long‘s art students, Lauri Huston. Watch carefully then tell me: who flew into YOUR cards today? NOTE: The comment field is at the top of the blog post. If you are the first to comment, it will helpfully read “No comments.” Click there! Note: I have personally read all of the books I referenced in this article and can recommend them to you as good companions on your Journey. The feathered ones have shadowed or accompanied me since, at least the 1980’s when I collected owl, flicker and hawk feathers for shields and feather “bouquets”in southern California. Pelicans, gulls, mockingbirds, cardinals, and parakeets were the birds of my childhood in south Louisiana. My three hens didn’t actually fly into my “cards” today. But they did flap and prance and puff and preen. They were good company as I worked in the garden – diligently digging and constantly commenting! Two bird books I have enjoyed: “The Human Nature of Birds” by Theodore Xenophon Barber, Ph.D. and “Feathers: The Evolution of a Natural Miracle” by Thor Hanson. Janet, Thank you for those two excellent book titles! I know you treasure our feathered friends as much as I do–maybe more cuz you IS one! ?